This charming, family-friendly condo is lovingly decorated and located in a quiet, residential complex yet only a 5-minute walk from an endless selection of excellent restaurants and bars (also known as the Golden Mile), and a 5-10 minute walk to the beaches. 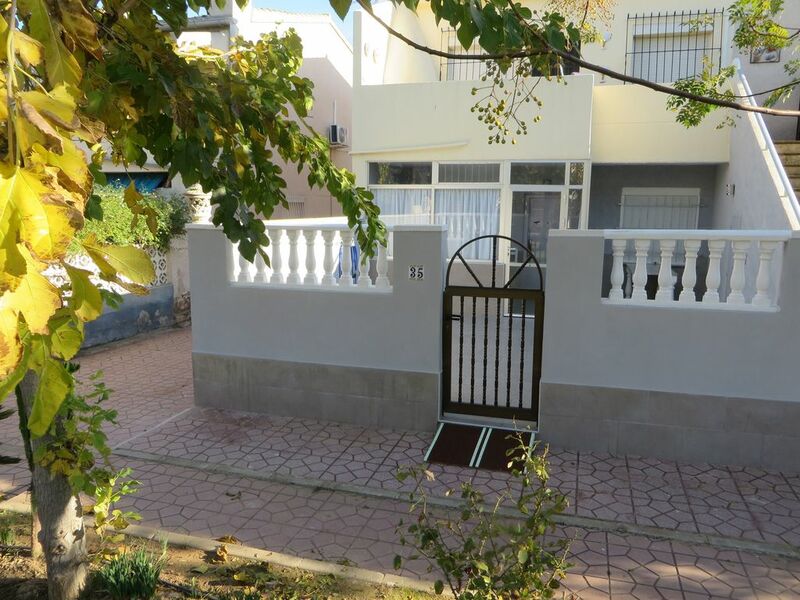 It is a self-contained, recently renovated apartment. It is located on the ground floor and has a spacious terrace, equipped with seating and lounging possibilities. Entrance: conservatory with dining table, living room with satellite TV (English, German and Spanish programs), Wi-Fi, air conditioning in all rooms cold / warm. Bedroom with king size bed, a twin bedded room, a modern kitchen equipped to a very high standard. The bathroom has a walk in shower. The beaches, such as Campoamor, Cabo Roig and La Zenia, have recently been connected to a very picturesque seaside promenade, where you can stroll along wonderfully and have a breathtaking view along the promenade and coastline. Nearby there are many high quality golf courses. The nearest ones are Campoamor, Las Ramblas and Villa Martin, which are only a 5 minute drive away. In addition to golf, there are many interesting activities, such as GO-KART driving, tennis and water sports. Just a few minutes' drive away, La Zenia Boulevard, with its shops, cafes, bars and restaurants, also offers entertainment. It is a large, modern shopping center with 150 shops, the largest in the province of Alicante. Weekly markets in the immediate vicinity are almost every day. A doctor's office and a fitness center are located across the street from the apartment. Additional cleaning costs of 50 euros per booking, payable directly to the local agent. Really enjoyed my stay here. Has a lovely big kitchen, washing machine etc everything you could need. Has a lush porch so you can sit in the beautiful sunshine! Good WiFi, Andi was really helpful, picked us up from the airport showed us in. The beds are comfortable and actually have decent duvets. Air con leaks a bit but works fine. really close to Cabo Roig strip so overall was 10/10 for us! Great apartment with everything you need supplied. Good communication from Johanna and Andi. Très bel appartement spacieux aussi , résidence trop calme, j'ai été touché par le jardin la verdure et le calme plat, très bien équipé, proche de toutes commodités, facile à repérer, un grand merci a monsieur Andi qui était accueillant et gentil. Ça convient très bien pour famille. Ça m'a vraiment plu et je reviendrai c'est sûre. Merci aussi a Mme Johanna la propriétaire pour sa gentillesse. La maison est grande et agréable. Elle est conforme au descriptif. Le ménage est un peu cher si on considère que nous avons rendu le logement aussi propre qu'à la réception. Andy a été très ponctuel lors des rendez-vous pour l'entrée et la sortie de la location. Beaucoup de bars et de restaurants aux alentours. Le centre commercial Auchan avec ses nombreuse boutiques et restaurant à 2 km.